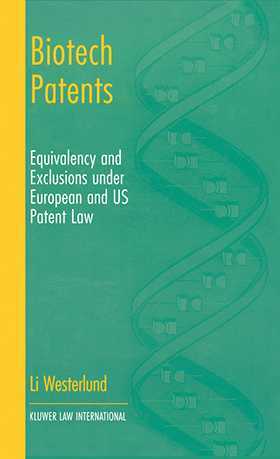 This book discusses patent legal issues regarding inventions in the field of biotechnology. The scope of a patent is of central concern, and since biotechnology is very different from other technologies, the requirements for disclosure and infringement are in focus. Eligibility issues are touched upon, although from more of an explanatory perspective, since the law is settled in this respect. The material for the analyses includes the European practices under the EPC, those of the United Kingdom, Germany, and the US. The mandated exclusions from patentability under the European patent laws of categories of plant and animal subject matter and certain biological processes are also analysed. Claim interpretation is the common theme. The challenge has been to present a comprehensive basis for grasping the substantive law for the field of biotechnology. The book examines thoroughly the differences between practices, and the consequences of those differences for the possibility of being granted a patent for an invention, and the infringement doctrines' effects for what might be called a patent's 'after-life', i.e. the scope of its protection. The principal message emerging in this book is the importance of relying on the policy arguments of uniformity and predictability in order to preserve a fair balance between an inventor and third parties, since in reality much of the controversy in this field turns on proper protection.